It’s turning out to be a Bosnia-focused weekend here. Marko Hoare has an excellent and sober assessment of Angelina Jolie’s Bosnia “imbroglio” up here. For those who don’t know, the British left often has an odd — to say the least — way of viewing the Balkan Wars. Mainly it consists of lionizing Milosevic as some kind of “anti-imperialist” simply because he was able to get his country bombed by NATO. This is an old article from Indymedia Ireland that explores some of the myths and flat-out denying that go on amongst some British leftists when they discuss the Balkans. It should serve as a useful warning for a treacherous path to “sinister idiocy” that sadly continues to influence thinking on the region. 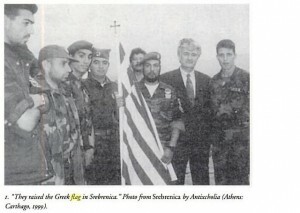 Finally, it seems that Greek nationalists have managed to clean the internet of any photos of their paramilitary unit, the Greek Volunteer Guards, with Karadzic and the Bosnian Serb leadership. But fear not, Takis Mikas’ intriguing book Unholy Alliance is up on Google Books. The above photo is from it. It’s worth pointing out he’s being sued for for stating that the Greeks were in Srebrenica, and it’s further worth pointing out what the name of the organization that’s suing him is. And here’s Hoare on the same issue. This entry was posted in Balkans, bosnia, human rights, macedonia, serbia, the right in europe and tagged balkans, bosnia, greece, macedonia, srebrenica. Bookmark the permalink.